In just a few short days, fans will be able to bring home Captain America: Civil War on Digital HD September 2 before arriving on Blu-ray and DVD September 13. We've already showed you a few deleted scenes from the bonus features, to get fans ready for this home video release. Today we have a brief yet hilarious gag reel. You won't want to miss a chance to check out some of your favorite Marvel superheroes cracking each other up. This gag reel surfaced on YouTube, featuring Chris Evans and Robert Downey Jr. taking a break to do a little dance during their climactic fight scene. Scarlett Johansson (Black Widow) has some trouble twirling her nightsticks before a scene. And Anthony Mackie (The Falcon) doesn't exactly have a smooth landing. We also see Jeremy Renner forgetting his lines, Paul Betany getting his tongue tied along with several of the stars making some funny faces. It's all in a days work for the Avengers of the Marvel Cinematic Universe. Captain America: Civil War was a huge hit with both audiences and critics, debuting to $179.1 million-the fifth-biggest domestic opening of all time-and earning a 90% critics rating on Rotten Tomatoes. Captain America: Civil War is the highest-grossing film of 2016 domestically, internationally and globally, earning more than $1.15 billion at the worldwide box office. It also continues Marvel Studios' winning streak as the 13th consecutive film from the Marvel Cinematic Universe to debut at #1 at the domestic box office. The Blu-ray and DVD release comes with more than 60 minutes of thrilling, exclusive bonus material. The special features include an inside look at the evolution of lead characters Steve Rogers and Tony Stark, a behind-the-scenes exclusive on the making of Captain America: Civil War, never-before-seen deleted scenes and hilarious outtakes. Plus, home audiences can learn more about the latest additions to the MCU and get an exclusive first look at Marvel's Doctor Strange, starring Benedict Cumberbatch, coming to theaters Nov. 4! These bonus features may vary by retailer, and the DVD does not come with any bonus features. When Captain America: Civil War arrives early on Digital HD, Digital 3D and Disney Movies Anywhere on Sept. 2 and on Blu-ray 3D, Blu-ray, DVD and On-Demand on Sept. 13, viewers can join the nonstop action and pick their side-Team Cap, commanded by Steve Rogers (Chris Evans), or Team Iron Man, led by Tony Stark (Robert Downey Jr.). Rogers and Stark are joined by a star-studded lineup of beloved Marvel Super Heroes, including Natasha Romanoff a.k.a. Black Widow (Scarlett Johansson), Bucky Barnes a.k.a. Winter Soldier (Sebastian Stan), Sam Wilson a.k.a. Falcon (Anthony Mackie) Colonel James "Rhodey" Rhodes a.k.a. War Machine (Don Cheadle), Clint Barton a.k.a. Hawkeye (Jeremy Renner), Vision (Paul Bettany) and Wanda Maximoff a.k.a. Scarlet Witch (Elizabeth Olsen), along with new recruit Scott Lang a.k.a. Ant-Man (Paul Rudd). These heroes are also joined by two new additions to the MCU, T'Challa a.k.a. Black Panther (Chadwick Boseman) and Peter Parker a.k.a. Spider-Man (Tom Holland). 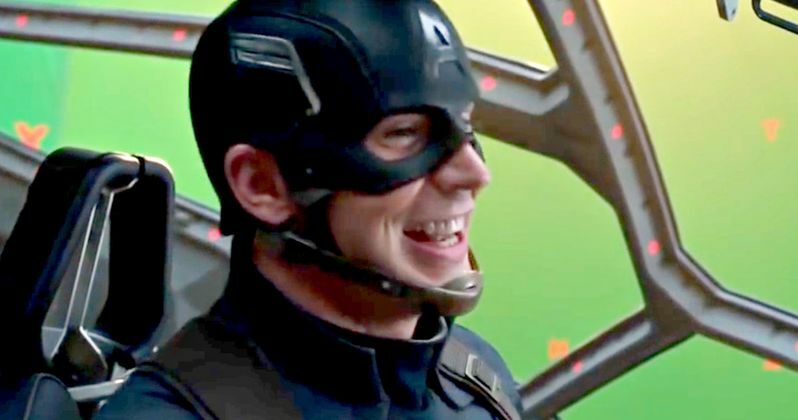 Take a look at this gag reel below, and stay tuned for more footage from the Captain America: Civil War Blu-ray and DVD release.